Educators require a broad knowledge that involves the physical, social, emotional, and intellectual development of students. The use of this knowledge guides learning experiences and enables mean ­ ingful relationships with students. Successful educators are able to consider the social and individual differences that affect interactions in an academic environment including developmental disabilities, attention deficit disorders, gifted education, substance abuse, child abuse, and family disruptions. 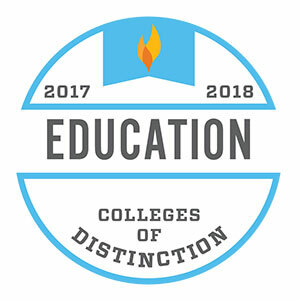 The faculty and staff of the VWU Teacher Education Program are committed to ensuring that prospective teachers complete an academically challenging liberal arts education that includes thorough preparation in the approved content area fields and for teaching the diverse learners of the 21st Century. The Teacher Education Program provides students with multiple field experience opportunities in diverse contexts beginning as early as the freshman year, strong mentoring by faculty and staff, engaging professional studies coursework, and pathways leading to initial licensure in 15 endorsement areas. In Summer 2018, the Teacher Education Program began offering a 5th-Year BA/BS to MAEd Program leading to initial licensure in six secondary (grades 6-12) and seven preK-12 endorsement areas.